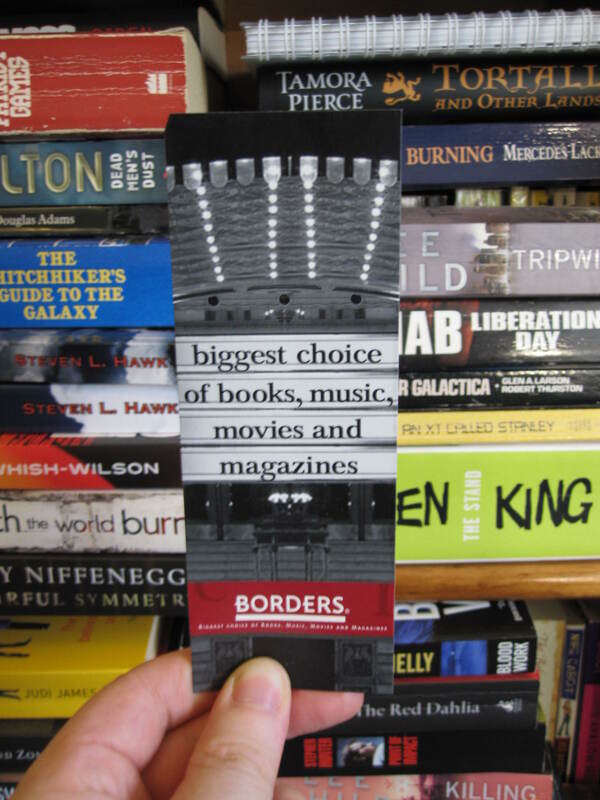 I am selling my limited edition Borders bookmark for charity. Any and all offers between $40 million and $50 million will be accepted. As many book fans will have noticed, there are a number of book retailers circling the drain of bankruptcy. Borders in the USA may have found a last minute lifeline, but here in Australia the Redgroup stores (Borders and Angus & Robertson) have gone the way of the honest politician. The superbly managed Redgroup managed to amass $170 million in debts, $44 million of that being owed to publishers (and consequently authors). The reason for me auctioning off my bookmark is that I hope to be able to not only share a piece of publishing industry history, but to also recoup the money that Redgroup stole from publishers and authors. Redgroup felt that selling millions of dollars worth of books that they didn’t own was really just a creative book-keeping issue. Nobody else did and now all we have to remember them by is this bookmark. The bookmark is not laminated, but I can have it laminated. I can also list the board of directors of Redgroup on the back if desired. Please, no time-wasters, this is an auction to save starving authors everywhere. Yeah. What is $44 million between friends? !